Get Pre-approved for Retail Finance - Less waiting and more shopping! Over 1,500 retail stores throughout New Zealand use our Credit Sales facility - giving you more choice when you're shopping around. From furniture to home electronics, car accessories to musical instruments, you'll be able to get what you want at a price you can afford. See a list of retailers that use Finance Now. Alternatively, you can do it all online in the comfort of your home. We'll let you know straight away if you've been approved at the end of the application - easy! * Things you should know: Finance Now's normal lending criteria and loan terms apply. Repayments shown are indicative only and include a $55 application fee and a $1.80 monthly service fee. Full disclosure of all of the terms of your loan (including the total amount payable over the term of the loan) will be provided to you prior to finalisation of your loan. Payment Protection Insurance (PPI) is optional and has NOT been included in the payment amounts below. There must be one single item in the purchase to the value of $150 or over. 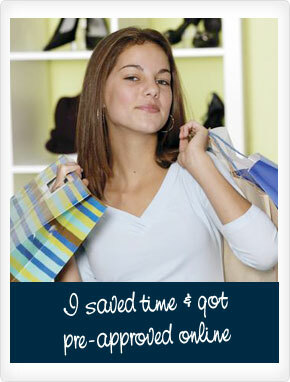 Get Pre-approved Online and Spend Less Time Waiting and More Time Shopping! Have you used Finance Now before? If so, we already have your details, so all you need to do is text the word Approve followed by a space and your Surname to 580 and you could get pre-approved instantly. * It's FREE to send and receive text messages. 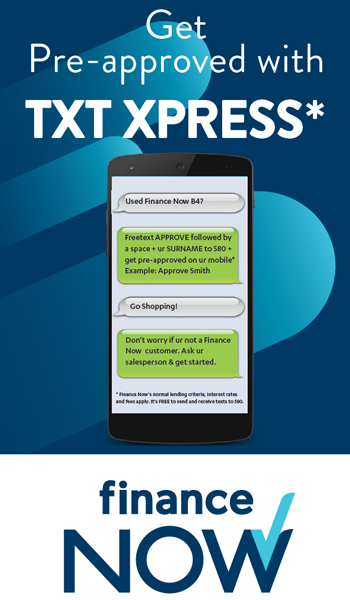 Click here for more information about TXT XPRESS. Or you can simply apply online by clicking the button below. ^ Terms and conditions apply: Finance Now's normal lending criteria and loan terms for secured lending apply. Pre-approval is based on the information previously disclosed to Finance Now. If there has been a deterioration in your financial position, Finance Now may refuse to provide you finance or may reduce the amount it is willing to lend you. Selected retailers are also able to offer chattels cover which covers the goods from fire or theft. It is highly recommended that you take this cover if you do not have contents insurance. * Payment Protection Insurance is provided by Third Party suppliers. The retailer that you purchase your goods from will provide you with a full policy booklet from the relevant supplier.